Since Nick Jonas and Priyanka Chopra's engagement was revealed in August (then confirmed a few weeks later), the couple have become cuter than we ever thought possible. This weekend, the Quantico star took to Instagram to wish a happy birthday to her fiancé, sharing two adorable photos. "Happy birthday baby.," she captioned one of the snaps. 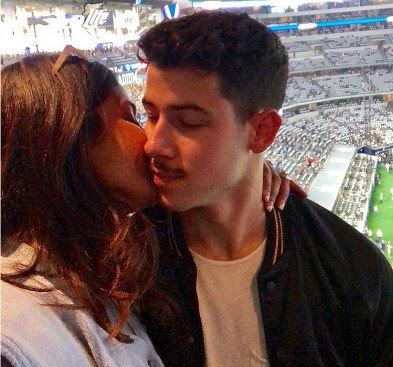 Nick and Priyanka started off his 26th birthday celebrations with a fun "birthday hang" at the Angel Stadium of Anaheim on Saturday, where they spent time with some of their closest friends. On Sunday, the duo then headed off to Texas to watch the Dallas Cowboys face off against the New York Giants at AT&T Stadium. Read on to see more photos of the weekend, as well as an adorable video of Nick's nieces wishing him a happy birthday.